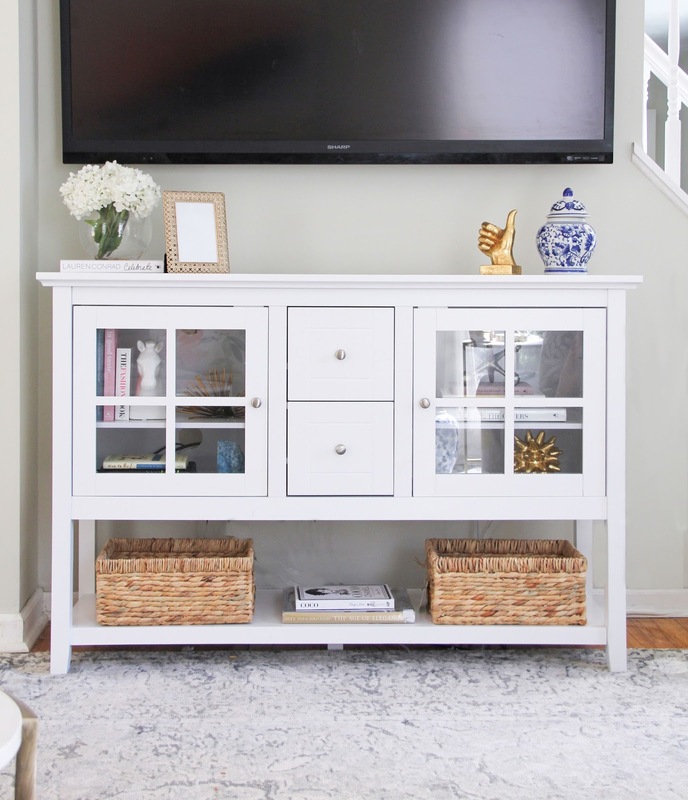 For the longest time I’ve wanted a white entertainment center, but with moving across the county; that was most certainly put off for a while. We have had our dark brown wood TV stand for quite some time, and our kids had broken off the face of one of the drawers. 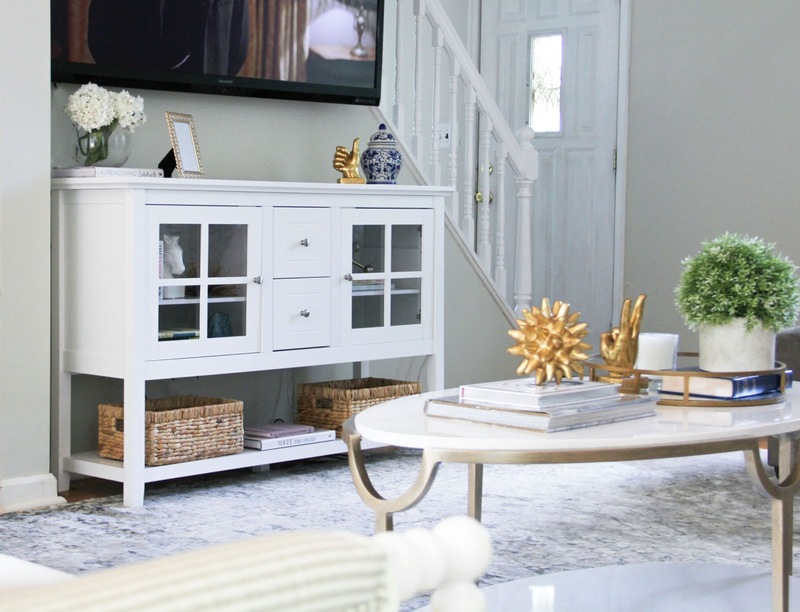 It was that one piece of furniture in the home I hated and secretly wanted to get rid of. How could I complain though when it still worked perfectly fine, and there were much bigger things to worry about than a silly TV stand. Anyway, now that we are (somewhat) settled, we decided to move it to the basement and searched for a white entertainment center that would fit our space upstairs. I was thrilled to finally be able to choose something lighter in color, to keep the space light and airy. 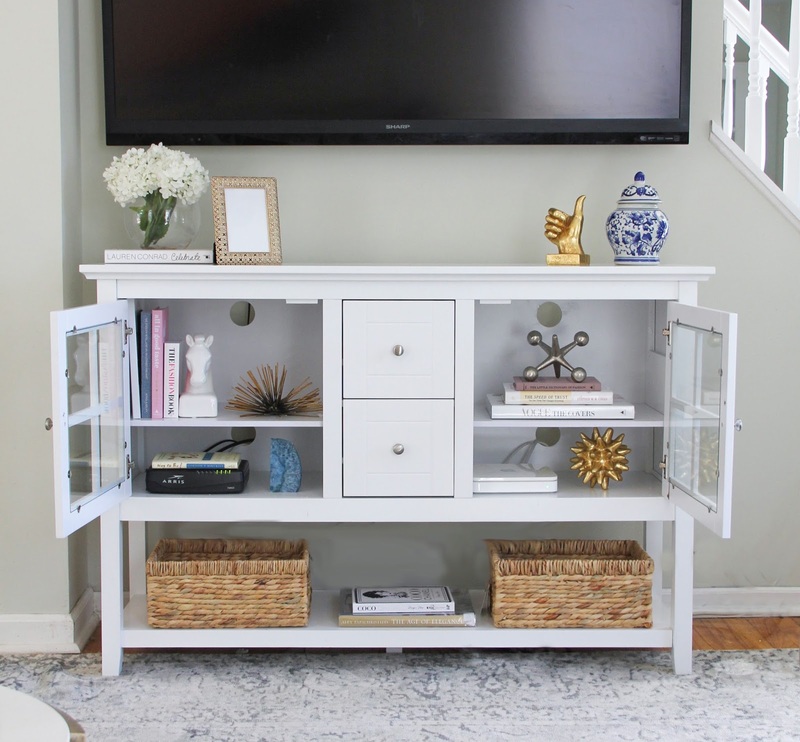 When I found this white console table from Walker Edison Furniture, I knew it was the one. I loved the open bottom leaving lots of space for storage and could picture cute little baskets at the bottom. Plus, it has lots of shelves to decorate (or put your DVD players etc in, but what girl really thinks of that!?) My husband and I put it together and the directions were easy to follow, and we are both happy with the quality. It was so much fun decorating all of the shelves and seeing it all come together. One thing I did not prepare for was how many books id need to decorate a small space. Who knew books with pretty spines could look so nice! Of course I chose books about fashion and home decor, as well as some of my husbands favorites. Then I accented with a few of my favorite decorative objects here and there to tie it all together. I hope you love it as much as we do. Hope you all have enjoyed your week thus far!